Clinical competency in PICC line insertion is of primary importance when it comes to improving the care of patients undergoing intravenous access. Armed with this knowledge, healthcare providers need to pay close attention to procedural training because of its considerable impact on patient safety. Whether a healthcare provider is administering medication, performing intubation, placing a peripherally inserted central catheter (PICC) or conducting routine patient assessment, the quality of training received is key to protecting patients from harm and ensuring proper treatment. PICC placement, in particular, is one example of a common medical procedure where patient safety and patient experience intersect in a most profound way. A peripherally inserted central catheter is an oft-used (and often successful) delivery system for patients requiring long-term intravenous access. In the hands of competently-trained healthcare personnel, placement, management, and removal of PICCs occur with few complications to none. But, when performed incorrectly the procedure can be very uncomfortable for the patient and, in worse case scenarios, potentially life-threatening. Malpositioning (misplacement, or faulty positioning of the device), luminal occlusion (blockage, or narrowing of a blood vessel), dislodgement, pain, contamination, symptomatic thrombosis, and catheter-related bloodstream infection (CRBSI) near the site of insertion are just a few of the adverse events that proper training may help to avoid. One way to acquire procedural competence in PICC insertion is through ultrasound education and training. Ultrasound-guided PICC simulator training allows for risk-free skills development that saves time and money while increasing knowledge retention. 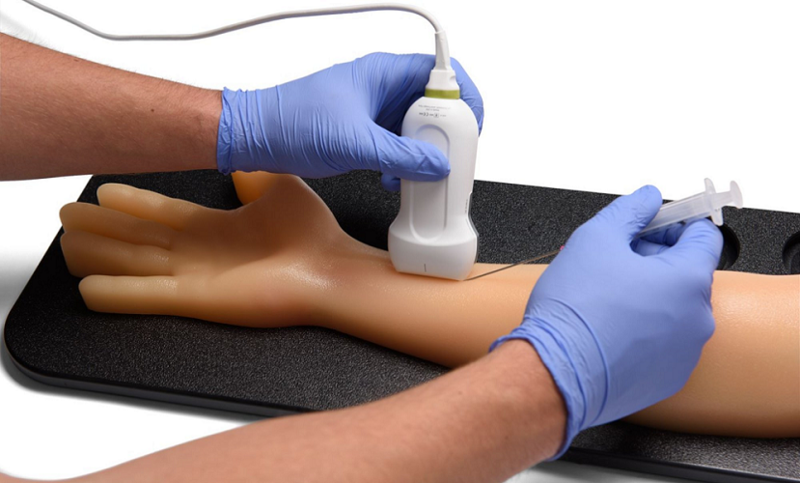 Ultrasound PICC-training facilitates mastery of venous access, builds user confidence, and helps to reduce the number of attempts (leading to an enhanced patient experience once the learner enters actual clinical practice). CAE Blue Phantom’s “Understanding Ultrasound For Guiding Peripherally Inserted Central Catheters” is an award-winning ultrasound training package that's been designed to promote best-practice standards and improve efficiency. Competency-based coursework offers careful instruction in guiding peripherally inserted central catheters with ultrasound, and in the successful performance of intravenous (IV) starts on superficial veins of the arm. This education package directs novice learners through a step-by-step process towards achieving a high level of understanding in how to utilize ultrasound imaging for peripheral venous access procedures. Develop and practice essential skills associated with safe, ultrasound-guided PICC line placement, arterial line placement, and peripheral IV access with CAE Blue Phantom. Learn to place and manage needles, guidewire, and catheters within the brachial vein, basilic vein, radial artery, ulnar artery and superficial veins -- even with difficult-to-access patients. Simulator training with CAE Blue Phantom's extremely realistic and ultra-durable models offers the opportunity for repetitive practice that builds confidence and skills, increases patient safety, and enhances the patient experience. Do more with Blue Phantom. **Users may upgrade from the Branched 2 vessel ultrasound training phantom model (included within the education package) to a Branched 4 Vessel ultrasound training phantom model at an additional price.